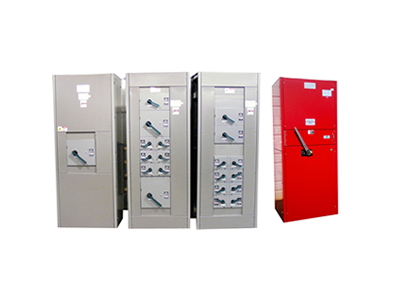 Deadfront Switchboards used in power distribution systems are used in commercial and industrial facilities to safely control the distribution of electrical power throughout the facility. Incoming power enters an industrial facility either through a utility metering compartment that can be incorporated into a Deadfront Switchboard, or some other service equipment. The power can then distributed through a single or multiple main circuits with various branch circuits for machinery loads, lighting, appliances, and electrical outlets. The role of a switchboard is to divide the main current provided to the switchboard into smaller currents for further distribution and to provide switching, current protection, and metering for these various currents. The voltages and currents involved will vary with the size of the application and the actual geography of the installation. Included in the list of switchboard elements are a frame, busses, over-current protective devices, utility service, revenue metering, instrumentation, and outer covers or “Dead-Fronts”. The frame is the backbone of our switchboards, it places and supports everything. We build our frame with precision using heavy gauge steel and quality finishes and hardware. 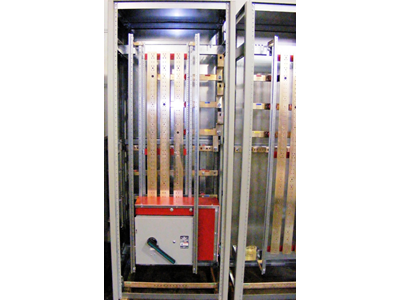 The standard Continental switchboard frame is 90 inches high and 36 inches wide. Optional heights over 60 inches minimum and special widths as well as “Build to fit existing” are also available in relatively short lead times. 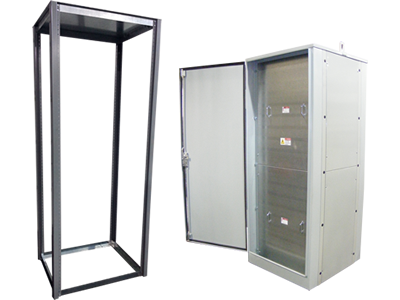 Our frame and enclosure style allows us to quickly make changes in dimension to handle custom sizing requests. Continental switchboards can have a minimum depth measurement of 20 inches when there is no need for through-bus. Continental Deadfront Switchboards use copper or aluminum busbar sized to the amperage requirement and braced per U.L. requirements, available up to 4000 Amps and 200 KAIC. Horizontal bus bars are generally used to distribute power to each individual switchboard section. Vertical bus bars are fabricated to distribute power via over-current devices to the individual loads. Bus bars are made of tin-finished aluminum or silver-finished copper. In the below picture you see a custom switchboard taking shape on our shop floor. The fused circuit here is configured to act as a fire pump main switch per code. The frame sections bolt together and splice plates will be used on the horizontal bus to feed power to the other sections. This is a very modular, quick to install, and reliable distribution system. “Extended Horizontal Bus” or “Cross Bus” is also referred to as Through-Bus. Because the load requirements in downstream distribution sections are generally less than in upstream service sections, the capacity of the through-bus can be tapered, or reduced, downstream as the load falls off. The through-bus can be tapered as compared to the ampacity of the incoming service mains. Full-capacity, or non-tapered, through-bus is also available. The ampacity of non-tapered through-bus remains constant throughout the switchboard. Cover panels are installed on the switchboard so that no live parts are exposed to the operator. The front cover is referred to as the dead front. These steel panels are also used as trim to provide a finished look to the switchboard. 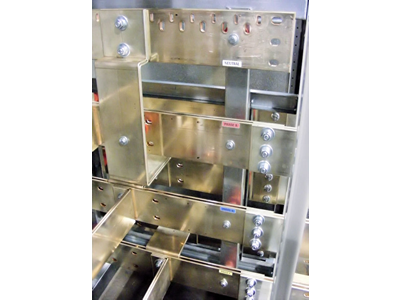 A manufacturers label identifies the switchboard type, any catalog number and electrical and enclosure ratings. On these dead fronts you will also find our serialized U.L. label signifying that it conforms to a very strict construction and safety methodology. Circuits are mounted with access from the front of the switchboard. This includes over-current protective devices, such as panel circuit breakers and disconnects switches. These devices are mounted directly to the bus bars or using mounting kits connected to the line side of the devices. Continental offers switchboards using circuits from a wide range of major manufacturers such as ABB, Boltswitch, Eaton, General Electric, Siemens, Schneider/Square D, and more. Continental offers optional Meters both with and without communication features on our Switchboards. 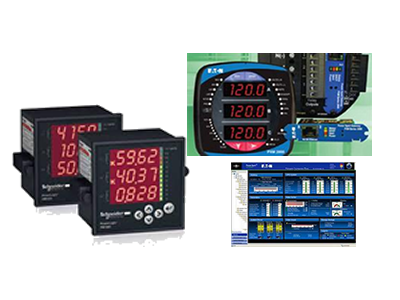 Meters can range from very simple and basic units to some of the most modern and complete data units you can imagine. Can your switchboard send you an e-mail when you have certain power quality or demand issues? Shouldn’t it be able to? Metering packages from a number of manufacturers are available. Continental Deadfront Switchboards that bear the UL Listing Mark are Underwriters Laboratories Listed under U.L. 891 File # E2004101 certified for the United States and Canada. This ensures that National Electrical Code compliance and user safety requirements are met. Continental Electrical Products use Powder-Coating technology as our finish on all of our standard products. This results in a superior level of corrosion prevention, durability, and is increasingly more of an environmentally conscious option. Reduced VOC’s and a better looking finished product are both results of this process. Fasteners and hardware also make a difference in overall quality. At a minimum we use Grade 5 or better, Zinc Coated USS & SAE Fasteners throughout our line. We go one step further and use Stainless Steel Hinges, Latches, springs, and Rivets etc. in many locations on our products. This produces a superior product at a competitive price. Simplified drawings, such as one-line, block, or pictorial diagrams are typically used to show the circuits associated with a power distribution system. Normally we generate a switchboard layout drawing in the ordering phase after we have received an official purchase order. 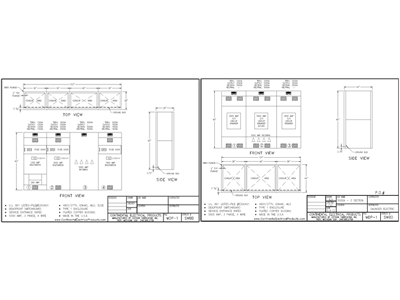 Drawings will state all of the specific electrical ratings, the Distributor, Contractor & Jobsite information if known, as well as circuit layouts and dimensions of the equipment proposed. Continental Electrical Products offers a warranty that is more than the typical industry standard. How can we do this? Because we offer a quality product that consistently meets or exceeds expectations. However if you should ever have an issue we will stand by our product and act within the terms of our warranty. Our future relies on your satisfaction every time. You can view our warranty statement by clicking the following link. Continental Warranty.